Can the Spurs really go marching on? Leave a Comment on Can the Spurs really go marching on? TOTTENHAM HOTSPUR have been receiving lavish praise for their stylish football this season, indeed the past few campaigns, but they still remain a team with a great future ahead of them. They have undoubtedly charmed audiences with their quality, not unlike Tottenham sides from the past, notably under the great Bill Nicholson. 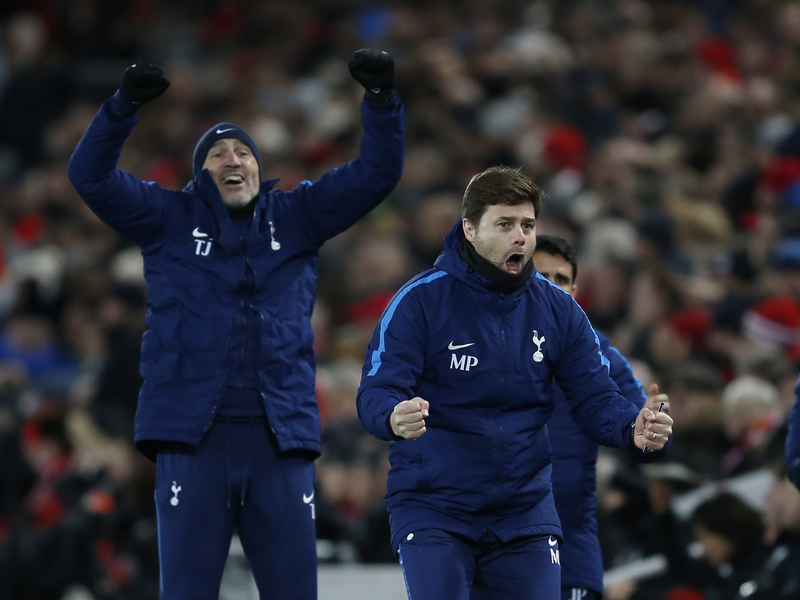 On the face of it, like so many Spurs line-ups from the 1960s, a couple in the 1970s and the David Pleat all-out attacking unit of the 1980s, Mauricio Pochettino still needs the anointment that will lift his young, vibrant squad above the pretenders. Where will it come from, how can Tottenham stave off the possible break-up of a collection of some of the most coveted young players in Europe? We’ve learned that Spurs don’t pay top dollar in terms of wages, which does make them somewhat vulnerable to dawn raids from Europe’s hungry squad hunter-gatherers when transfer windows come around. It hasn’t quite happened yet, but if Tottenham cannot monetize the hard work they’ve put in on the pitch – and behind the scenes – then the future of players like Harry Kane, Dele Alli and others will be in doubt. With Tottenham possibly going through the sort of holding position that Arsenal found themselves when they moved home, success on the field will be Tottenham’s best currency as the purse strings become even more closely managed. The laudable project of improving infrastructure and laying cash accretive foundations may effectively weaken their position in the short-term, unless they can keep winning games. This season they won’t be challenging for the title, the best they can hope for is a Champions League place, which should be within their grasp. However, that alone may not be enough to move Spurs up a gear. Over the past five years, they have been in the top six every season. Like Arsenal and Manchester City. They’ve flirted with a title challenge, but they haven’t touched silverware since 2008. For Tottenham to transition from attractive, upper-quartile residents to genuine title contenders, one thing certainly must change – they have to win away from home against their peer group. In five seasons, including this year, Spurs have won just twice against the recognised top six clubs in the country: 2-1 at Manchester United in 2013-14 and 2-1 at Manchester City in 2015-16. This season, they have lost three of their four away games and drawn another, and they have Chelsea remaining on their traveller’s dance card. Their record against the big guns is improving, but both they and Arsenal are relatively weak when it comes to the really vital clashes. Although recent games with Manchester United and Liverpool suggested Spurs are ready to move up the hierarchy, but the problem is, for everyone, City are so far ahead and so ludicrously resourced, that the top prize is beyond them. It is not just the nature of their football that rightly earns Tottenham plaudits. In this era of oligarchs, oil men and business tycoons, the club has shown some restraint in the transfer market and is some way behind the big spenders in the Premier. This was an accolade once given to Arsenal, but this season, the Gunners have written cheques for over £ 100m and signed not one, but two of the most sought-after strikers in Europe. They have also generated £ 123m of income from transfers. Tottenham have spent £ 90m this season on Serge Aurier (£23m) and Lucas Moura (£25m) from Paris St. Germain and Davinson Sanchez of Ajax (£42m), but recouped £ 76m. The combined outlay by Chelsea, Liverpool and Manchester City was over half a billion! Tottenham’s major signings have one thing in common aside from European experience – they are relatively young, which fits in well with Pochettino’s squad dynamic. As well as proven talent, they also have space for development, especially Sanchez who is just 21. Look closely at the Tottenham squadand there are a lot of players who are coming to the crucial stage of their career, where their next contract could be career defining. Danny Rose, Eric Dier, Kane and Alli, arguably the club’s crown jewels, along with Christian Eriksen, fall into this category. The decisive factor this season may well be the Champions League itself. So far, they have had an excellent programme, winning five of their six group games, including a memorable 3-1 win against Real Madrid at Wembley and a 1-1 draw in Spain. Juventus, although Italy’s champion and packed with Champions League experience, may not be the insurmountable hurdle it once was. Certainly, a good showing in the 2017-18 competition – this season there are many possible winners – and a top four Premier place would give them the best chance and optimal bargaining tool to keep their star names. With the new stadium in full flow now, expected to open in 2018-19, the revenue from Champions league football would be invaluable. Ultimately, Spurs have to prove that they are not just “the new Arsenal” in championing relative prudence and achieving just enough to keep their public happy. Get past Juventus and already, their European credentials will be better than perpetual last 16 losers. Then see what happens. As for the Premier, somehow Tottenham need to add enough quality in the summer – possibly in order to satisfy their manager – to mount a title bid from the off. That’s if they can keep their existing stars in place. Everyone loves and fondly remembers an entertaining team, we’ve seen it down the years with Bobby Robson’s Ipswich Town, Dave Sexton’s QPR, Ron Greenwood’s West Ham and Kevin Keegan’s gung-ho Newcastle United. In fact, Spurs have filled that role themselves. But while teams like Ipswich delighted people with their progressive football, they – like Newcastle – never won the title. The challenge for Tottenham and Pochettino is to finally lift a serious prize and leave their mark on history. It’s a huge task, because there’s no such thing as a level playing field, but football needs a club like Tottenham to be rewarded for doing it just a little bit differently from Europe’s bloated corporate elite.